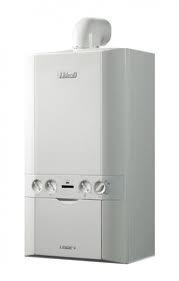 The Logic+ is the advanced range of combination boilers from Ideal, featuring a small footprint size and 5 year parts and labour warranty * as standard. Fully modulating down to as low as 4.8 kW’s, the Logic+ provides excellent energy savings, making it the perfect choice for new or replacement installations. Available in outputs of 24, 30 and 35 kW’s, the Logic+ is designed to ensure a quick and hassle free installation thanks to concealed connections, built-in automatic bypass and an integral filling loop. A translucent condensate siphon also allows any debris to be spotted quickly and efficiently. Siting the product is quick and simple too thanks to a telescopic flue, push & clip flue turret connections, and zero compartment ventilation which allows the product to be installed neatly into a standard kitchen cupboard. A clear and simple 16 character digital display provides simple operation of the heating and hot water functions, while fault codes and a history log provides further reassurance. Complete with a 5 year parts and labour warranty * and recommended by the Energy Saving trust, the Logic+ delivers total home comfort and customer peace of mind.